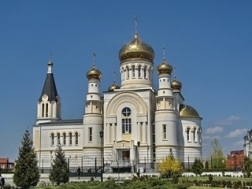 On Thursday the Holy Synod of the Russian Orthodox Church decided to create a new diocese with the center in Makhachkala. This proposal was made by the Archbishop Zosima of Vladikavkaz and Makhachkala and supported by Patriarch Kirill and the members of the Synod. In his report Archbishop Zosima expressed his opinion on the desirability of a new diocese in Dagestan for more active care of the Orthodox residents of the North Caucasus. The Holy Synod decided to form a separate Makhachkala diocese of Dagestan, Ingushetia and Chechnya (previously they belonged to the Vladikavkaz Diocese). Abbot Varlaam *Ponomaryov” from the Transfiguration Monastery in Murom, of the Vladimir Diocese was elected the head of the new diocese.